Artisan's work suit 04100 J54 230g one piece cotton SABS. This is a durable lighter overall in a one piece style. This means it will cover your body from the neck down to your ankles and wrists. 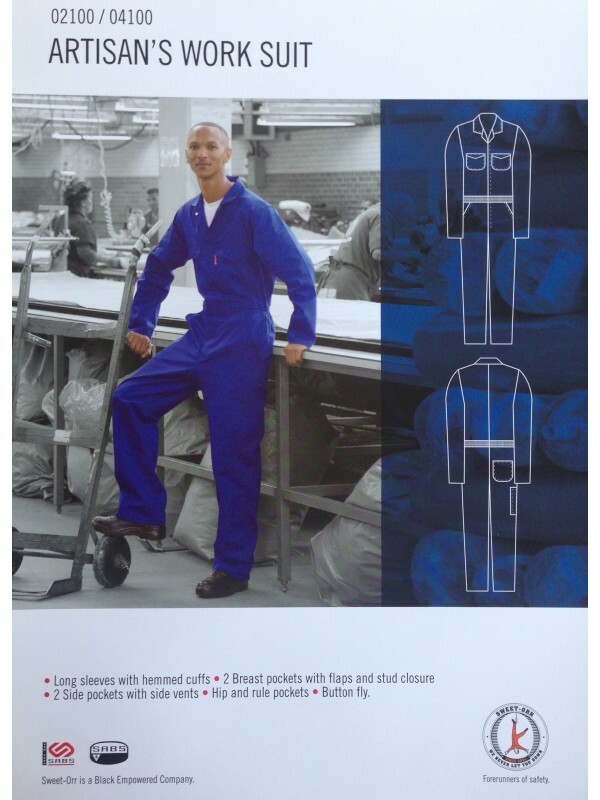 It comes in navy blue and royal blue colours this is a general purpose heavy duty cooler overall / boiler suit as it is made from the thinner 230gm material making the overall / boiler suit last longer and insulates a little less. It has been SABS tested and approved so you can be assured that it is made to the highest standards of quality. It is a tough durable and will last you a long time. It is ideal in any working environment requiring regular protection. This overall is 100% cotton so it is breathable, warm in winter and cool in summer, it has buttons to close the front, making it breathable and adjustable for your comfort. This overall / boiler suit is made from a 230gm material and is SABS quality approved. if you have any questions please feel free to write to us using the contact us page for more information.